There is a vernisage that you won’t want to miss...if you liked the show "Chickasaw" last year, you’ll love the book it was based upon! 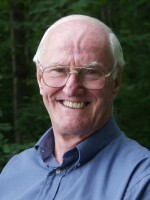 Local author Donald Davison is finally releasing his book after much work, revision, blood, sweat and tears! Visit Don's Official Book Website...it's really wonderful! The book is an historical novel of the Civil War as it happened one peaceful day in St. Albans Vermont when some Confederate rebel soldiers came down from Montreal to raid the banks and steal over $200,000. 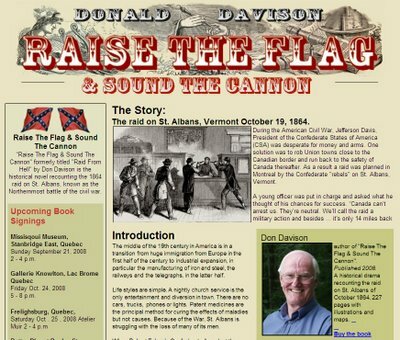 How about a small excerpt from Don's Book “Raise the Flag & Sound the Cannon” which comes from his own website (my...such a fantastic website indeed) which delves further in to the historical drama which is one of the delectable gems of the stories from the Eastern Townships! Let's take a listen: "Jake Thompson was the oldest of the three. His beard was short and curly. His face was a little heavy and looked more like a bulldog on the prowl. His red face looked like he was about to scream all the time. His eyes were as black as coal with a demeanor that was quite enigmatic. He didn’t laugh easily and one did not argue with Jake without feeling the fear of the almighty breathing down your back. Clement C. Clay was taller and slighter than Thompson. He had a full beard and looked older than Jake. With a very straight back, he fit well into his southern genteel clothing, giving him the look of the perfect southern gentleman. The way Jake pulled out his gold watch chain and the manor, in which he touched his nose with his silk hanky, made him a man of obvious culture. The third man, George Sander of Virginia, was much younger than his two seniors. He was shorter and thinner than Clay. While clean-shaven he was always grooming his small mustache. George was a dapper man by northern standards. Fortunately he laughed easily. Mr. Sanders reported to both Thompson and Clay." Brrrrrr....doesn't that just stand the hairs on end!! Don worked tirelessly on the stage production of Chickasaw which was a wild, musical rendition of his literary work mixed with talents of his friends: the local scamps, writers, creatives, musicians and trouble-makers that reside amongst the trees in the Townships who find great pleasure in turning fiction into stage renditions! BRAVO! See More of the group in action! Surely this is a great chance to come and meet the author, Don Davison, in his environment...surrounded by shelves of books, sitting behind a sturdy wooden table in a library chair...perhaps with a brown paper bag perched nearby filled with something that only a Jazz musician would dare contemplate! For those of you who have been hiding under a moss covered stone for the last year Don is one of Knowlton's well-known characters who is not only a gifted writer but also a pillar of the community!! He has been known to offer his support to artists, thespians, nature lovers as well as having been spotted encouraging folks on the treadmills at the local gym! He has been involved in productions at Theatre Knowlton and his workings with such scallywags as Graham Hardman who is notorious and greatly appreciated by local rascals, for such joint-efforts as Chickasaw.ca! At the corner of 104 and Echo Rd. The next day, Saturday, Oct. 25, 2 – 4 pm. is well worth the trip. We’ll be having a vernissage there too! Quoi de Neuf 2009- What's New in Knowlton! Brome Fair Feedback: Not All Grade "A"